I think before we begin this week we should spend a few minutes talking about venture capital, crowdfunding, and Initial Coin Offerings, or token sales, as they are more commonly called now. The reason is that this is the second week in a row that we are focusing on a company that is established and which has already been through a couple of rounds of traditional venture capital funding. And like last week, this company is turning to an ICO as another channel to raise money and to expand operations. First, let’s talk about venture capital. The main difference between banks a nd venture capitalists is that they first, expect equity in the companies they fund. Maybe the easiest and most entertaining way to learn about this somewhat traditional method of funding is to watch an episode of Shark Tank where you can hear all about the value of a company and the expectations of those that invest in it using this model. The type of vetting that goes on between the capitalists and the entrepreneurs gives you a little bit of an idea of why venture capitalists believe they do a service to business in general, by carefully analyzing and proving the team, their vision and their operational ability. But of the tens of thousands of businesses that form each year, only a tiny fraction will have access to venture capital. Thus, with the advent of the Internet and sites like Kickstarter and Indiegogo, the crowdsale was born. In this model, anyone can invest in almost any amount, and the accumulation of the crowd can provide enough money to launch a company. In this case, a video on Youtube of a prototype, a halfway decent website, and most importantly a good, marketable idea can result in as much or more money that capitalists might venture. This method has launched tens of thousands of products and thousands of companies. Now, the VC crowd argued that this method was suspect, at best, since who was vetting the companies? With a barrier of entry set as low as a youtube video, they argued, the vast majority of startups using this method would likely fail, since they weren’t put through the paces as they would be with VC involvement. But this is the same argument that was made by the publishing industry in the early days of electronic publishing, where they claimed that the literary world would be flooded with, charitably, works that maybe should not have been published at all. If you have a kindle, and noticed some of the ads that appear when you turn it on, you might tend to agree, although just because there has been a proliferation of less than stellar work doesn’t mean that there aren’t brilliant self-published books. It’s the same for companies. There are plenty of companies who might have been able to get through a round of Venture Capital funding, but that chose a crowdsale because they wanted a degree of independence. I had the pleasure of speaking with an individual just three days ago who had been through several rounds of funding himself, and he confirmed that while the VC world has its benefits with respect to connections and business, it also very often comes with strings – well, let’s say ropes, attached. The one thing that a bank will never do is tell you how to run your business. Some venture capitalists are not shy about offering that sort of strongly worded advice. So now there’s this new method of crowdfunding where there is usually a blockchain-based token that is issued and often results in a large amount of money raised in order to fund a project or a company. So what’s the main differences between this and something like Indiegogo? There are several – the first, of course, is the token. And whether or not the token is mineable, or whether or not the token performs a purely utilitarian function, and no matter what the companies say to discourage speculation, the fact remains that many , if not most ICO tokens end up on an exchange and are traded. And in some cases they increase in value – and dramatically. Not only that, even if the token that is issued doesn’t increase in value, the token that is collected as part of the sale – usually Ethereum and Bitcoin, does. This is not something that happens with Venture Capital. Capital raised by that method is money, and it’s spent. For instance, to take a modest sale – when the WINGS ICO took place in November of this 2016 the company raised just over 2,000 Bitcoins. At the time, this was worth about $2M USD. What is what they collected worth 11 months later? $8.4 M. So even if they spent half of the bitcoin they raised they still have left twice the USD that they initially raised. The other difference between ICO’s at the moment is that there is almost zero regulation of them. The online Crowdsale industry has been around a bit longer, and there has been some clear direction from the SEC regarding these. But the added element of the token is something that has taken regulators by surprise. Recent action by the SEC, plus more aggressive actions by countries like China and Korea indicates that we are just beginning to see the regulation of these sales – but as of now, there isn’t much. One of the most important differences between the token offering and venture capital is that by definition, and by the one thing that is clear from the SEC, is that token sales cannot offer equity in the company – or future profits by the company. Venture Capital is exactly the opposite, with expectation of future profit sharing as well as a percentage of the company in the event that the company is sold. Whether this lack of accountability in the ICO world leads to widespread abuse remains to be seen – and will be closely watched and reported on, I’m sure. This company, which is operational with an existing platform, is intending to use a token and blockchain technology to fill some gaps that currently exist in the real estate rental market – but specifically medium-term rentals. Traditionally, medium term rentals, which are defined in this case as a rental between a month and a little less than a year — have been served by the corporate rental market in the last couple of decades, mainly in response to a more mobile workforce, and a more project-based economy. This is typically where there’s quite often a team of people working on a project with a beginning and more importantly an end, where the team goes home. But as the whitepaper points out, recent demographic trends have expanded this market a great deal. For instance, according to a research report by Bank of America Merrill Lynch economists and reported by Business Insider this June, it appears that the millennial generation, described as between ages 25 and 34 – are buying less and renting more. Part of this is because they are squeezed by 1.5 Trillion dollars of outstanding students loan debt, but some of it is as Stayawhile lists in the whitepaper, that this generation is simply more nomadic, and less inclined to set up a nest. There was one chart on this report that was striking, where it showed this age group over the last four decades, with a dramatic rise a living situation outside the standard domestic situation. This age group belongs to a generation where the place you reside is less important than what you can do – and its possible now to work from practically anywhere. Another very important point this report made was that this age group is flocking to urban centers. There is yet another exodus from the rural and now from the suburban areas of the country to the urban city centers. This trend is something that Stayawhile intends to capitalize on, by providing an upscale rental market in stylish urban settings with the convenience and immediacy that the millennial generation demands. The other thing Stayawhile seeks to address is the great deal of difficulty that foreign nationals experience in finding a place to stay for months at a time, where credit worthiness is more difficult to prove, various internatioinal measures to establish trust don’t line up, and it becomes difficult and quite expensive for people to move as fluently across borders as it perhaps should be. And recent political trends in Europe with Brexit as well as political developments in the US seem to indicate that this situation of tightening of borders is not going away anytime soon. And finally, the Stayawhile platform plans to use the blockchain to create a much more efficient method of rental logistics – such as deposit, escrow and dispute resolution using mutli-signature transactions as well as smart contracts running on the Ethereum blockchain. First of all, It’s important to note that this company has already been through a couple of rounds of private equity venture capital funding. So in terms of the company, our due diligence is pretty much done, and from a business leadership perspective, that’s a huge plus as well. Why? – well, my opinion is that it’s more efficient for us to let the venture capitalists fund our due diligence for us –- and also vet the team – and simply recognize that they will probably do a better job of it than we ever could. Not to say, of course, that we didn’t do our own looking around. And about that – I honestly think that if you visit stayawhile.com I would challenge you to find something you DON’T like about the way this company presents itself – from the original and pleasing design of the website, to the excellent way in which they communicate their ideas and themselves, to the resume’s and linkedin profiles – there are immensely talented people. Also, I have to say, this is absolutely the very first team I’ve looked at with respect to token sales that has a robot on the team – how cool is that, really? However, there is one thing that we would be remiss to bring up, and that’s that there is no one listed on the team that has extensive blockchain experience – at least not that I could find. There are programmers – how could there not be , since they have a fully functional platform for rentals that they built themselves, so we know they can complete a project – but no specific blockchain specialists are listed on their team. This particular whitepaper is quite good at presenting the business model and the potential market share of about $10 billion, and clearly shows how that market share is underserved and under-represented. The whitepaper also showcases, with photos of actual properties under management, the design and branding philosophy of the company. 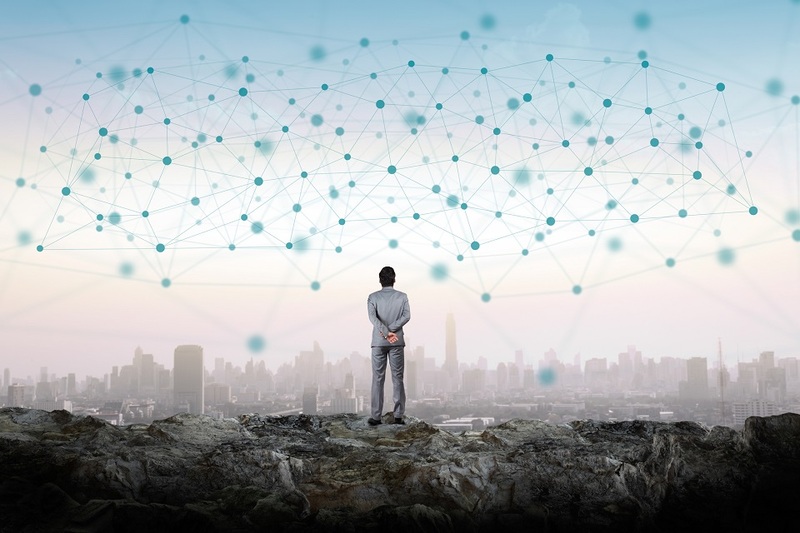 Section 2 describes the ways in which the blockchain can assist in solving some of the problems and inefficiencies in standard real estate transactions. The classic example that we see in BitCoin 101 classes, is the escrow problem. The landlord needs a security deposit which is held while the tenant occupies the property. At the end of the term, the tenant vacates the property, and if the condition is left at the standard specific in the terms of the agreement, the security deposit is released back to the tenant. Using a smart contract and a tokenized payment system, it’s possible to use a multi-keyed signature transaction where two of three keys are required to release the funds. One key for the tenant, one key for the landlord, and one key for a neutral third party. When the tenant vacates, they apply their signature. Now only one remains. If the landlord inspects the property, and finds is as agreed-upon, then they apply their signature to the contract and the transaction is completed. If, however, they find issues, then they can refuse to sign. The tenant would then appeal to the third party. Evidence would be presented by both sides, and the third-party would then presumably have the ability to adjust the payout accordingly and then apply their signature to release the funds. Presumably, the tenant and landlord would share in whatever fee the third-party would require for their service. You might ask “how is this more efficient than an escrow company?” It’s not mentioned in the whitepaper, but I can answer that – first, the escrow company is going to charge a fee regardless if they are required after all. In this case, a fee is only incurred if the service is needed. Secondly, we should presume that the people who provide this service will not require the typical type of overhead that an escrow company would require, and so the fees should be much lower. Third, there are no banking intermediaries between the escrow company and two sides of the transaction. It’s all one simple, but conditional, transaction. I feel like this whitepaper does a pretty good job of showing precisely how specific functions and methods from the Ethereum ERC20 standard can be applied to specific business issues. One good example is that because of the relatively transparent nature of a public blockchain like Ethereum, it’s possible for one side of a contract to retrieve the balance of the account of another side of the contract. This can act as a sort of security measure, wherein the contract can be validated by capacity. Think, for a moment, how this is done in real life. I’m sure there’s plenty of you who have had to scan and email banking statements to prove that you have a certain balance in your bank account in order to complete real estate transactions. In this case, it’s done by maintaining a token wallet with a certain balance and using the blockchain to conduct all aspects of the contractual relationship between tenant and landlord. Furthermore, and this is not mentioned in the whitepaper, but it’s also true – the profile of a tenant becomes more transparent and their status is influenced by the “stake” the tenant has in the token. Needless to say, however, a token holder is free to create as many functional wallets as they need, so if there is an issue of privacy, it’s possible for them to obscure portions of their stake in the network. So if we use our imagination can see, even if it’s not articulated in the whitepaper, how consuming API’s from background check agencies, and information returned from those API’s could be used in a the smart contract to approve membership – and perhaps reward the new member with a wallet and a small balance – this I could see. One particularly laudable section of the whitepaper is their treatment of the problem with differing international credit tracking systems and the idea of creating a blockchain-based Stayawhile credit scoring system. Now this is a good use of the blockchain, due to the immutability and transparency of the technology. The only slight issue with it is that if it’s used in its purest form, immutable means immutable – so mistakes cannot be reversed, as you can in a relational database with a simple update query. But of course correcting transactions can be added to the blockchain, which, if designed correctly, could have the same end result. The difference there would be that those so-called corrective transactions could be only performed by the holder of a certain type of key or token, if necessary. At that point, we start to slide into the concept of a permissioned blockchain – not a bad thing – but not specifically mentioned in this whitepaper. All in all, this seems to us to be a well-thought out whitepaper worthy of consideration by anyone interested in ICO’s. The road map shows an administrative portal in place by the end of the third quarter of this year, with the construction of the blockchain architecture and smart contracts initially deployed by the end of 2017. By the first quarter of 2018 we should see a token wallet and a payment system using those tokens. The second quarter projects the ability to waitlist properties and discounts, plus a priority mechanism. In the third quarter they plan to implement the FICO replacement concept with tokens to demonstrate creditworthiness. In the last quarter of 2018 they plan to implement supervised machine learning for optimal apartment pricing. This is an interesting point since there was in fact a paper published by some researchers at Northwestern that wrote a spider to scrape Craigslist which yielded about 4000 rentals and used a concept in machine learning known as a regression tree to accurately estimate what rental prices should be based on 10 separate attributes – like number of bedrooms, type of property, pets, parking. They found that using machine learning principles that they increased the accuracy of pricing rentals significantly. This is not something that is specifically related to blockchain, but it’s a nonetheless interesting feature for the platform. Some longer-term visions include things like internet of things with smart digital locks. I would imagine that could be tied to a smart contract where the apartment is unlocked based on a payment. The name of the token will be STAY. The price as of the moment is not set, because of the fluctuating price of ETHEREUM. The token sale begins on October 30th at 12 AM Eastern Time. And ends November 30th. The token issuance, if you participate, will happen starting in December. There are pretty aggressive discounts with a 75% discount for the first 25,000 tokens sold, and a 50% discount for the next 200,000 tokens sold. Then a 25% discount for the next million. Payment can be made using ETH, and they will be using KYC and AML screening – which is Know Your Customer and Anti-Money Laundering. The whitepaper lists what amounts to a soft-cap of 500-1000 ETH to be considered a success, and the paper mentions a refund if this soft-cap is not met. The total token allocation is set for 50M. 55% will go to the Public sale, and 30% reserved for future use. 15% of the tokens will be allocated to the team. In the whitepaper it’s not mentioned, but on the Telegram channel the CEO explained that team tokens – those are the tokens provided to the team, are locked for 6 months, and then 1/24th of the tokens are unlocked every month thereafter for the next two years. Unsold tokens are reserved for a future sale and that accounts for 30% of the tokens. The reaction from the crypto currency community has not been particularly passionate one way or another and there has been a lack of volume. Reddit, BitCoinTalk, and other channels have not had a lot of feedback in their announcements, although the team is obtained good advice on the telegram channel so we can expect that to change. One thing that has been observed on Telegram and is in fact quite true, that the high-trafficked sites that provide ICO listing charge large fees to get listed, and it’s hard to choose which, if any, will bring the results. At some point in our future we see a project where we investigate the relative success of ICO’s that obtain professional help from established teams in the ICO space that offering marketing and operational services. In terms of business viability, we agree with the market that the Staywhile team has identified as the young and relatively rootless demographic, but we also see the other side of the demographic spectrum as well – that enormous baby boomer sine wave that has pushed through the last half dozen decades like an enormous marketing supertanker – the people in that demographic are similar to the generation y set – but more numerous. And many of them have the same rootless attributes as do the younger generation. So from our perspective we see two similar but interestingly different markets for the medium term housing market, as retirees seek more meaningful experiences abroad. Right now, of course, the Stayawhile footprint remains in the US, but it’s clear that plans are in the works to move to at least major cities in Europe and elsewhere. For me, the final takeaway is this – Stayawhile is an attractive and estabished company that has already been vetted to some extent by the venture capital world, which is a plus. They have a pretty solid idea, and there are certainly valid users for a tokenized system – for instance, the replacement of a FICO type of system, and using the blockchain to reduce fees, and streamline the vetting process seems reasonable and valid. The team is quite willing to communicate in our experience, and we wish them the best in their sale and then subsequent project.